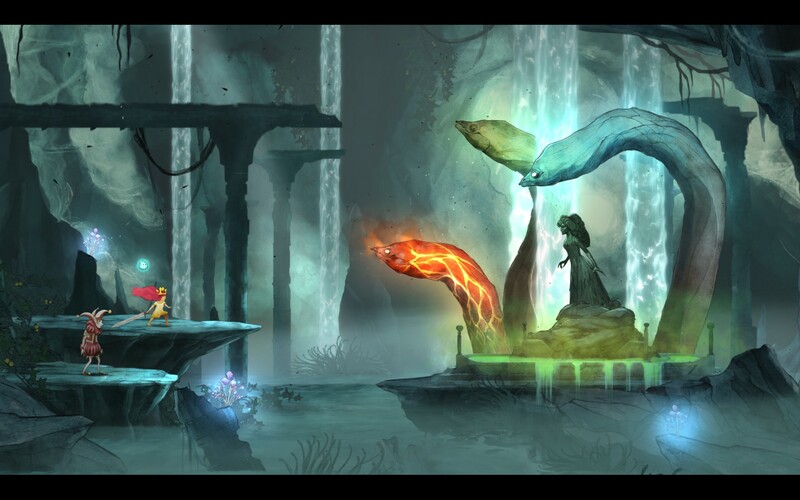 Child of Light: A World Flooded With Water, and the Story of a Daughter. Reviewing a game every week has been a great way to discover my internal set of negative biases towards certain types of games. Indeed I wouldn’t have known that survival horror games just aren’t my thing had I not attempted to slog through several of them, something which is contrary to the fact that I played through many of the original Resident Evil series. Turn based combat is another mechanic that I’ve found myself avoiding but recent examples of how it can be done well, like for South Park: The Stick of Truth, have started to break down that barrier. It was the main reason I didn’t jump on Child of Light right away and whilst I might still not be a convert to the turn based combat system I can at least begin to see its merits when applied properly. You play as Aurora, daughter of the king and heiress to the kingdom of Austria. One night though you are struck down with a terrible illness that, strangely, sends you into a mystical world quite unlike your own. This new land you find yourself in has had its moon and sun taken from it by the evil queen Umbra, plunging the world into darkness and enslaving its population. You soon find out that there’s only one way home: you must restore the moon and the sun back to its people so that the way between your worlds can be opened once again. Time is of the essence too as the visions of your world that leak through show that it is in danger, and needs your help just as much as this strange new one you find yourself in. 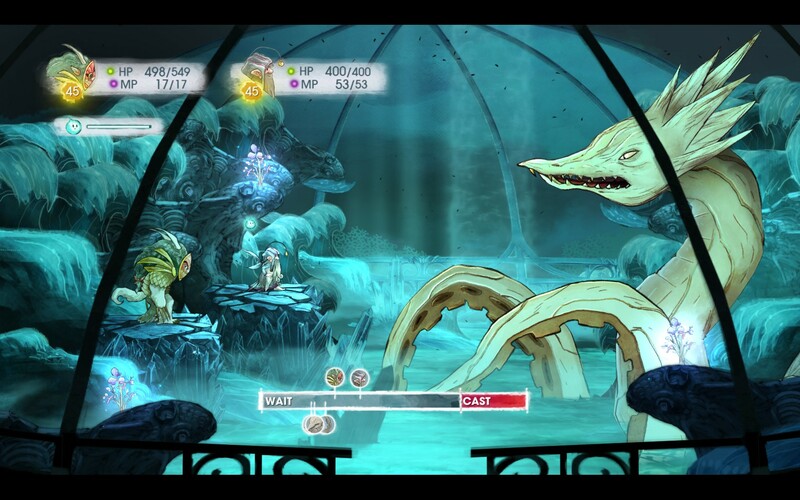 Child of Light has a delightfully well done art scheme, with everything for the characters to the environments having that whimsical feeling about them. The art style is done as if everything was painted with watercolours with the wide and varied palette bleeding and fading into each other. It’s also done in a 2.5D style with the backgrounds being largely static and the characters being cel shaded 3D models. 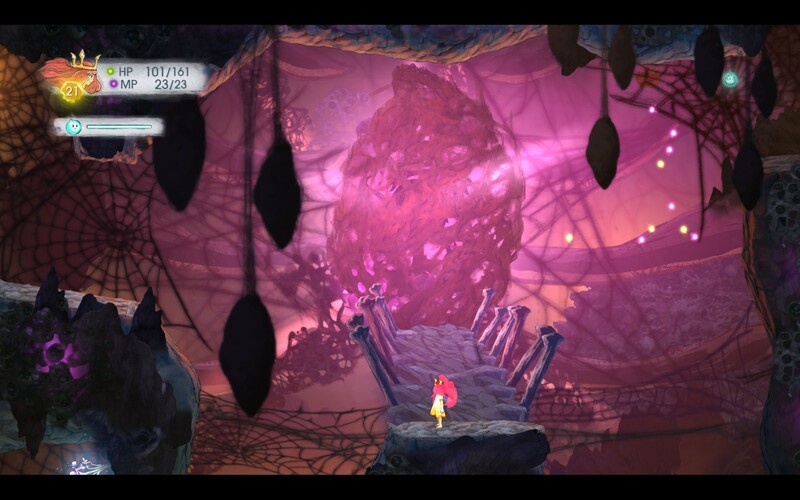 This allows Child of Light to have some pretty impressive effects as well as some nice little touches (like Aurora’s hair) that really help to build up the whimsical feeling. Ubisoft Montreal has definitely taken a page from the Blizzard book here the visuals are rarely boring, especially with the large amount of variety in the environments. 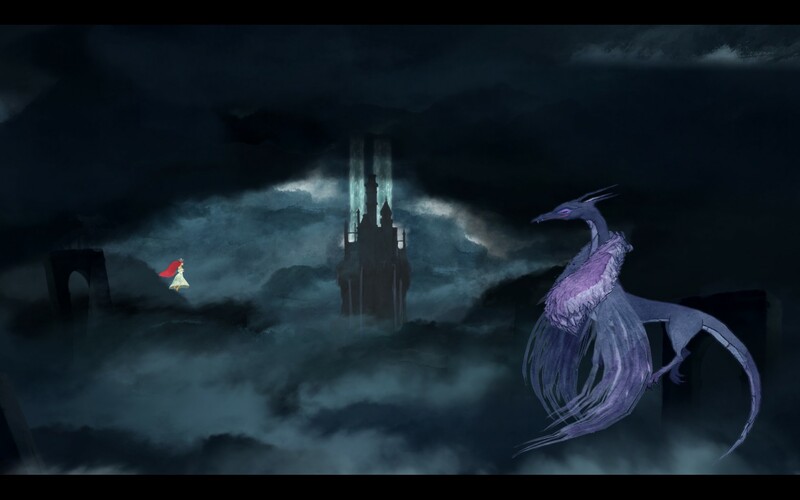 From a core game perspective Child of Light is a best described as a side-scrolling RPG with turn based combat that uses a system similar to the Final Fantasy time active combat system. All the classic RPG elements that you’d expect to find are there including an experience system, talent trees with multiple arms and specializations, item progression and, of course, numerous party members to manage. Whilst the systems that have been implemented are probably more on the simplistic side (at least from a veteran RPGer’s perspective) there’s still enough depth in all of them that 2 playthroughs are unlikely to unfold in the same way. Finally there’s a crafting system for augmenting your character in certain ways, something you’ll need if you don’t want to spend hours fighting battles. The combat system works well as it encourages you to think strategically about what actions to take when and whether or not you’ll be able to complete them. Once you’re in the “cast” section of the bar you get to choose a skill to use which all have a varying amount of time associated with them. Should someone attack you during the cast you’ll be interrupted and sent back to halfway through the “wait” bar. There are ways to speed yourself up and slow your enemies down but you can also judge how long their abilities are going to take to cast and react accordingly. The AI, for the most part, is predictable enough (it will most likely attack whichever of your party can attack the next) but working around the various abilities that they have is what provides most of the challenge. Like most games that use elemental damage types every enemy has strengths and weaknesses meaning that it’s nigh on impossible to build Aurora, or any of your characters, as a jack of all trades. This is made even more complicated by the fact that some enemies are weak to magic and not physical attacks (or vice versa) something which isn’t readily apparent from just looking at the enemies. Indeed whilst you can kind of work out what they’re likely to be weak to given their appearance (things on fire probably don’t like water) there’s no way to inspect the enemies and have that information presented to you. Worse still there’s no health bars for you to look at and the only indication that you’re close to finishing an enemy off is when they slump down. Considering you can be having an encounter every minute or two small things like these start to wear a bit as you’re never quite sure of just how powerful you are (or aren’t). 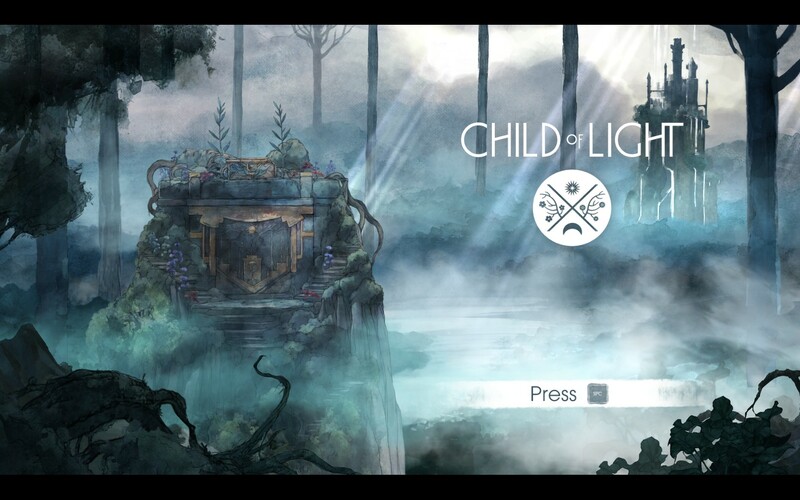 The levelling system feels like it needed a little more attention as whilst it’s always nice to have a sense of progression Child of Light is light a desperate friend trying to impress their new date, constantly begging for your attention. At least one of your characters will level up after each fight, normally multiple ones of them, necessitating that you switch over to the character screen in order to allocate their talent points. Sometimes this leads to a meaningful upgrade, like a new version of a spell, however most of the time it’s just more stat building. Honestly it would’ve been far better to have fewer levels with those stat upgrades built into the levels themselves. That way I wouldn’t have spent a good 20% of the game simply managing my party, making sure I’d spent all their points. The Oculi crafting system is a pretty neat idea as it allows an alternative means of progression which is totally under your control. Whilst there seems to be some obvious choices for certain slots (the extra XP from the diamonds seems like a no brainer) some of the more advanced gems, weapon slots seem to be a lot harder. Whilst you can chop and change as many times as you like it can be somewhat annoying to have say a fire gem equipped and then end up facing water enemies. Essentially this means that you’ll often find yourself pushed into sub-par fights which, whilst not impossible, are usually quite tedious. Being able to change Oculi as an action during combat would be a happy medium and would go a long way to removing a lot of the repetition present in Child of Light. If I’m honest the rhyming couplets style of dialog really annoyed me as whilst some of it was done to great effect much of it just made comprehending them that little bit harder. I feel that the story would stand on its own quite well however the method of its delivery ultimately detracted from it. It’s a shame really as the rest of the things that go into building that story (like the music, foley and art style) are really top notch. Perhaps this is the more cynical side of me coming out as I’m typically not a fan of whimsically styled things, such as the Studio Ghibli animation which this is apparently inspired by, but honestly try sitting through 8+ hours of people rhyming incessantly and let me know if you feel any different. Child of Light is a beautiful game that, despite its simplistic approach mechanically, provides a very satisfying experience. The art style is unique and gorgeous, bringing to life the whimsical world that lives in many a child’s minds. It’s not without fault however as the simplistic nature has been taken too far in some respects making some parts of the game laborious, confusing and repetitive. These are not things without fixes however and I’m sure Ubisoft Montreal will be able to rectify this in subsequent titles released in this genre. There’s a lot to like in Child of Light, something that I’m sure will delight RPG fans out there, and I definitely count it as time well spent. Child of Light is available on PC, Xbox360, XboxOne, PlayStation3, PlayStaion4 and the WiiU right now for an average price of $14.99. Game was played on the PC with around 9 hours of total play time.